Welcome to the United Kingdom! We’re University for the Creative Arts Students’ Union (UCASU). UCA has students coming from 91 different countries, so we’re excited to welcome you into our diverse and talented community. Your union is more than just a place that sells cheap beer (though they usually do that, too)… students’ unions are organisations run by elected representatives and are responsible for representing your interests. Elections for these representatives take place every year. Each union is slightly different and offers different services, but most of them follow a similar structure. The services they offer can vary from advice to academic representation, to campaigns, clubs, societies and anything in between! Students’ unions exist to make students’ lives better, not just your social experience but your academic experience as well. This section of the website includes information from the UK Government and from departments within UCA, as well as anecdotes from past and current students. If you have any questions that aren’t answered in this section, please come to your students’ union office, or contact one of your elected officers by Facebook or email. Setting up a bank account is one of the first things you’ll want to do as a new student in the UK. You’ll need it to pay bills, rent, and travel costs. When you’ve got some time, head into one of your local banks. It’s best to have a look online to find out which bank works best for you. You can use your existing bank account, but it’s more difficult in the long term than setting up a new one. With a non-UK account, if you want to take money out at an ATM you would be charged for the conversion of currency. You also need a UK bank account if you are planning to find work while you’re here, as it’s much easier for your employer to pay into a UK account. What do you need to set up an account? Most people forget to register at a local doctor’s office when they first move but if you fall ill at some point during your time here you’ll really wish you’d done this sooner! If you’re an EU student you will need to apply for a European Health Insurance Card (EHIC) so you can access emergency care within the NHS. You can do that, and find out more on the NHS website. It is advised to apply for one especially if you’re going to travel abroad (within the EU) and you’re an EU national. You can also look up where your nearest doctor is. What do you need to register with a Doctor? The same as you need to open a bank account! New students should consider ordering an TOTUM card. These cost £12 for one year, £22 for two years, or £32 for three years. This card can get you discounts at all sorts of shops, restaurants, online services and on the 16-25 Railcard. You can order them online and then pick it up from your local Union office. Getting a part-time job alongside your studies is a good way to get some extra cash to travel and support you along the way. The Union has a number of part-time positions available through the year so keep an eye out if this is something you’re interested in. If you are an international student, you’re eligible to work part-time and the hours depend on what type of course you’re doing. If you’re doing a foundation course, you can work up to 10 hours per week. If you are on a degree course you can work up to 20 hours per week during term time. Outside of term time there is no limit on how many hours you can work. Check your BRP for how many hours you’re eligible to work. If you’re an EU student, there are no restrictions on the hours you can work. Alright? – Hello! / How are you? It’s important that everyone takes some time out to look after themselves and take a break from the day to day stress of life and work. Go to a park, get some exercise or treat yourself every once in awhile! The National Trust website has an array of places that you can visit in the local area as well as green walks you can go on for a break away from life. Canterbury has an exciting atmosphere – there’s almost always something going on! If you live in Hotham Court, you can buy groceries at the big ASDA, only a 5 minute walk from you. In the other direction you have a very busy town with a variety of restaurants and places to grab a quick bite to eat! Other things around the town include the Canterbury Cathedral, a National Heritage site which as a UCA student, you can access for free with your Student ID. There are also River Tours and a number of country parks, gardens and museums in the area too! Canterbury has a busy night life, filled with clubs and pubs like The Jolly Sailor or The Ballroom – both of which offer open mic nights as well! Best of all, we have our own bar on campus, where you can attend or organise social events and club nights. Epsom is small but busy – there are dozens of restaurants and bars around town, including Blacks Burgers (famous for its Instagrammable freakshakes), The Faraday, and Caballo Lounge. On a day off, you can visit the Odeon for films, see a show at the Playhouse, or escape to nature as there are several lovely parks in the Epsom area! The Epsom campus has a common space attached to the canteen where you can go to study, listen to music, play foosball, or just meet other students. Only 35 minutes from central London the train, Epsom is a very well-connected campus, so you can easily access all that London has to offer while studying in a more relaxed atmosphere during the day. Farnham is our biggest campus, but in the quietest town. In the local area you can find several big supermarkets including Waitrose, Sainsbury’s and Lidl all within the town. There are also plenty of choices of restaurants and cafes, ranging from big chains to independent businesses. If you want to stay active there are multiple gyms around town, or you could go for a nice stroll through any of Farnham’s park. The town has plenty of pubs dotted around – 24 in total! In the next town over, Aldershot, you visit Cineworld to watch the latest films and from there also make a shopping trip into Guildford. Waverley Abbey is a short bus ride away which not only is set in a quaint park, but is also the set for films such as Into The Woods, The Mummy and The Huntsman. Chatham has a useful shopping centre called the Pentagon which has nearly everything in it. If you can’t find something in the Pentagon, you are sure to find it in the high street! As for the nightlife, Tap is the most popular between students. Rochester also offers lots of food options from fast foods, sit down chains and a selection of independent restaurants. There is a big ASDA in Rochester which is a short car or taxi ride from campus. You could also visit the local castles and manor houses for a bit of history! Specialist Advisors are available at each campus to provide information and guidance to students on a wide range of practical and personal issues. Each advisor is a member of the National Association of Student Money Advisers and the University is a member of the UK Council for International Student Advice. They can help you with issues related to money, visas, work, police registration, or accommodation, whether with other students or at home. This week will give you the best opportunity to meet new people and learn more about what you can do at UCA. Each campus will have a Freshers’ Fairs where clubs and societies will be out looking for new members, local businesses and charities looking for volunteers, and the Union will have a stand to help you figure out how to get the most out of your university experience. Another highlight of Freshers’ Week is the variety of events going on, including taster session from one of our clubs and societies, a daytime event or a nighttime bar event. Need help? Got questions? Contact [email protected] for independent advice. Whether it’s about resits, complaints, bullying or anything else the Union may be able to help! Also, if you’re looking to really make a difference, you can run to be a Course Rep within your class. It is a fantastic way to get leadership and communication skills, while helping to develop your course in a positive way. Contact your tutor about this at the beginning of term. Clubs and societies are an amazing way to meet new people and learn skills. One of the hardest things when moving so far away from home is building a support network, which is why it’s so important to make friends. Clubs and societies are the perfect way find a new and friendly community, whether it’s through football, cheerleading and yoga or anime, gaming and faith, there is something for everyone. They’re all run by fellow students and if there isn’t one you’re interested in, you can speak to our Clubs & Societies Coordinator, Vanessa Silva, and she will be more than happy to support you to get it all set up! If you’re interested in joining a group that campaigns and works to make change for students, taking part in one of our Liberation groups or our newly formed International Students’ Assembly is a good start. 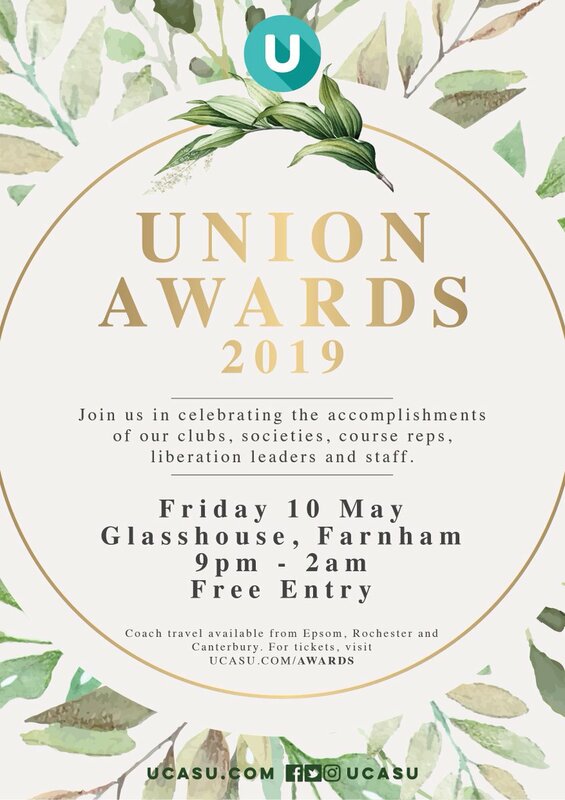 UCASU currently has 4 liberation groups, LGBTQ+, BAME, Women, and Disabled Students. These groups are open only to those who define within them and are supported by the Vice-Presidents to work on campaigns and event. Previously, the groups have walked in London Pride, organised debates and held an invisible disability awareness campaign. If you want to find out more, you can contact our Student Voice Coordinator, Taylor Kane. While we have our daily events throughout Freshers’ Week and our weekly events through the rest of the year, we’re more than happy for you to come to us with your ideas. If you want to raise money for charity or just propose an event idea, come in and speak to our Events & Campus Life Coordinator, Hadley Keenan, who can help you out!